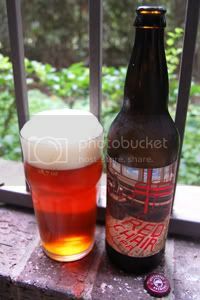 Originally known as Red Chair IPA, Deschutes' spring seasonal beer is now listed as an American Pale Ale and known as Red Chair NW Pale Ale. It's a move I support, as upon first sampling the beer when it was a special-release bomber, I felt it was much closer to an APA than an IPA. Anyway, name and style aside, let's get into the nitty-gritty. The backbone consist of Northwest Two-Row Pale, Crystal, Carastan, Carapils, Munich, and Pilsener malts, while the hop bill is made up of Cascade and Centennial varieties. Deschutes describe the resulting brew as having "the citrus punch of a big IPA, minus the one-dimensional hop sledgehammer." Sounds like a winner, lets dig in. Appearance: A slightly hazy, rich red-orange body capped by over two fingers of creamy, off-white head that features fantastic retention and lacing. Aroma: Bright, citrusy and piney hops over a caramel malt base. Taste: Up front, lots of bright hops with citrus, pineapple, pine, and herbal notes. The hops are bold, but not overly bitter. Underneath, there's a biscuity caramel malt backbone keeping everything decently balanced. Just a mild hint of alcohol towards the end leading to a mildly bitter and biscuity finish. Drinkability: The 22 ounce bottle disappears quickly, making this a great session beer. Verdict: Red Chair is a very tasty and sessionable brew, another in a long line of impressive beers from Deschutes. I totally agree that this slots into the APA category better than it does with the IPA category, but at the end of the day it's just the same great beer.